Whispers in the Loggia: "A Church That Doesn't Listen Can't Be Credible" – Opening Synod on the Young, Pope Seeks "The Prophecy of Our Time"
"A Church That Doesn't Listen Can't Be Credible" – Opening Synod on the Young, Pope Seeks "The Prophecy of Our Time"
Once upon a time – not all that long ago – the Synod of Bishops was more a monthlong junket than a deliberative flashpoint: for the most part, participants glazed through weeks of speeches and wrapped each day's business in time for ample dinners before rubber-stamping the Curia's proposals at the gathering's close. Put simply, that's not the case anymore. 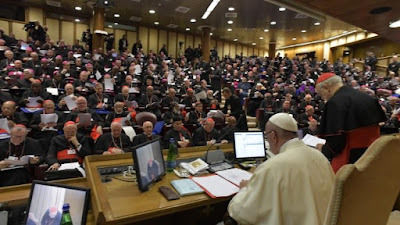 An amplified role for the Roman Synod – and synodality in general – having been a cornerstone project of Francis' from the very inception of his pontificate, the process now consumes the global representatives at the three-week assemblies, which have increasingly been geared toward substantive shifts in the church's engagement and pastoral practice at ground level. 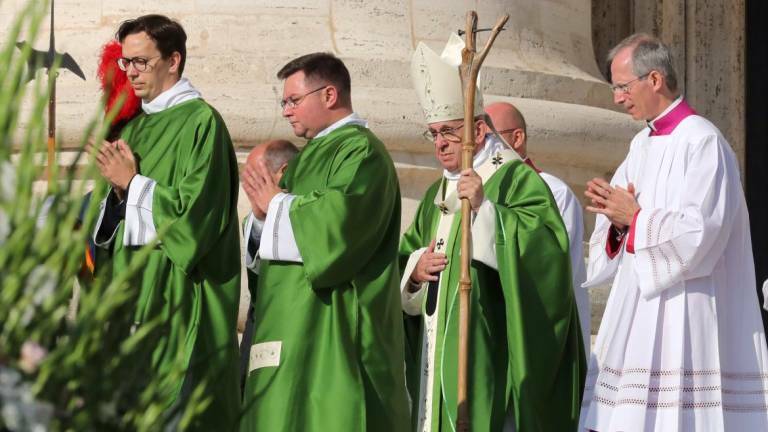 And now, over two years in the making, after a prelude that's featured even more heated controversy than before – not to mention the ever-looming backdrop of a fresh season of scandals – this Wednesday saw the opening of Papa Bergoglio's third Synod, this time dedicated to "Young People, the Faith and Vocational Discernment." This edition's planning begun in early 2017 with the now-standard consultation of the whole church, then fleshed out further by an unprecedented Pre-Synod last March attended by 300 young adults from across the globe, Francis' gradual, seemingly irrevocable overhaul of the process took another leap forward over recent weeks with his issuance of two new governing documents for the Synod (which have yet to be translated fully into English). While a pontiff has always been free to do whatever he wishes with the event's outcomes, the most consequential piece of the reforms explicitly codified the possibility that, should he so choose, the Pope could promulgate a Synod's final document – its 100 or so paragraphs each voted upon by the 260-odd members – as a magisterial text in its own right. As the new norms took immediate effect, and given the fights at Francis' prior assemblies over non-binding language in the final texts – specifically those pertaining to the reception of the Eucharist by civilly remarried couples – the notion of this gathering's last word being integrated into church teaching on the spot has exponentially increased the stakes in the home stretch. Since the whole concept of an amplified Synod is geared toward letting the process play out, lest anyone forgot, a lot can happen over the three and a half weeks ahead. Along those lines, only following the first week of brief remarks by each participant before the full assembly does the brunt of the discussions kick in with the move to the circuli minores ("small groups") of roughly 20 members each, their makeup determined by language. 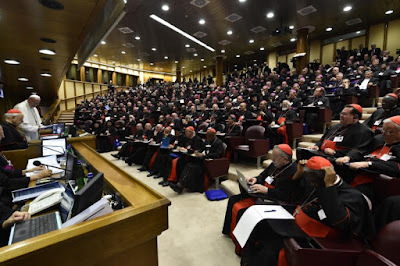 With Francis having tapped 34 young people (aged 18-29) to join this Synod as non-voting auditors, despite their lack of a ballot on the final text, they nonetheless have full voice both in the Aula sessions and the breakout groups. In the meantime, as the Pope's opening talks inevitably set the goalposts for what ensues, today's rare midweek start unusually brought both of the standard first words in rapid order – all of six hours after an inaugural homily that saw Francis implicitly look back to his own formation in the faith by his immigrant grandmother, the gathering's business began in the late afternoon with Papa Bergoglio's programmatic address. An employment of acrostic footnotes conspicuous by its absence this time, here in full is Francis' opening text (emphases original).